One of the most interesting presentations at our recent Active Learning Conference at the University of Illinois at Chicago was made by a team of active learning rock stars from University of Western Ontario (Western) in Canada. The session, presented by Kem Rogers, PhD and Sonya E. Van Nuland, MSc could easily have been titled, “If You Build It, Will They Come?” as it documented their efforts to modernize online undergraduate education at Western. Their Department of Anatomy and Cell Biology was among the first at Western to put courses online. The move to online courses was prompted by several factors, not the least of which was the influx of new learners for whom communication technology and eLearning is integral. Western is one of the early adopters of the Echo360 Active Learning Platform. They selected Echo360 because of the potential to increase student engagement, improve the overall user experience, and take their online course offerings to the next level. During implementation, the Echo360 support and product teams worked very closely with Western to help ensure success. 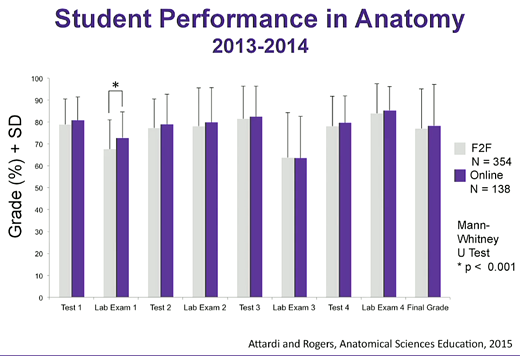 Student performance / outcomes were statistically the same whether students took their course online or in a face-to-face class. Past academic performance, not the course delivery method was a better predictor of student performance. What is the student and instructor reaction to the use of the Echo360 Active Learning Platform? The loved the ability to watch / view their course lectures from any location, at any time. They especially liked the ability to view course material in “close-up.” This is especially important when presenting anatomical features. You cannot always see everything as well if you are sitting in the back of a large lecture hall. Advantage: online course. They liked having the capability to access a recorded lecture multiple times. This can be very helpful during review for exams. They liked having the ability to easily upload their PowerPoint presentations to the cloud. They liked the ability to interact with their students online, and draw / annotate on slides just as they would in their face-to-face classes.